Over the last couple of months, I have been making Reggie, my recycled dragon. He's being made out of old tyres and lemonade bottles inspired by Pinterest posts which I wrote about earlier in the year. I wanted Reggie to have wings so he wasn't mistaken for Nessy (the Lochness monster), and this is where my DVDs came in. Well, I actually bought a box from the car boot for a couple of pounds so we're still in keeping with a thrifty dragon. In my naivety, I got a pair of scissors, a DVD and just cut straight down the middle. I learnt a few valuable lessons right there and then! 1. 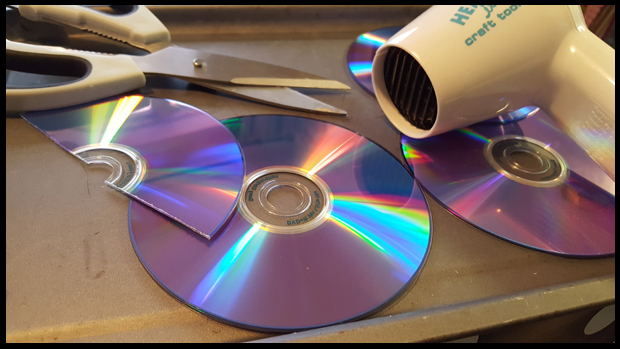 CDs can and will splinter, split and discolour if using the above method. 2. The pieces will be sharp and look ugly. 3. Eye protection is important if there is a chance of pieces shattering. Use a hair dryer or heat gun. Apparently, you can use a hair dryer on high heat, but I went straight to my craft heat gun by Ranger (as I'd not had a chance to use this since I picked it up as a bargain on a Facebook page!). I found that it really didn't take much to heat the DVDs up to get a nice clean cut from them, still with my scissors. Protect your hands. You must use some for of tongs or gloves to hold the DVDs once heated as they can get hot very quickly and we don't want any nasty accidents in the name of upcycling. Once my recycled dragon is complete I'll be sure to update you all on how I created him and what the finished product, complete with wings looks like.